Earlier this year, I received a Jefferson Award for public service, which involved a trip to Washington, D.C. to, among other things, give a one minute speech describing the community work I do. It's a challenge to edit one's work down to a minute, but recipients from across the country gave it a go. If you've noticed any shift by the nation onto a better trajectory in recent months, it just might be due to the transformative power of all those highly concentrated speeches. If there's someone you'd like to nominate for a Jefferson Award, of any age, they're taking nominations through Jan. 31, 2014. My sense is that people doing environmental work are underrepresented in the Jefferson Awards. Here's a link for more information. Locally, Sustainable Princeton is seeking nominations for its annual sustainable Princeton leadership awards through January 6, 2014. Here's the link for that. Yesterday, I looked out the back window to see our Pekin duck, Daisy, rotating her head to look skyward (haven't managed to capture that in a photo). Usually, that means there's something interesting up there. This time it was a Coopers hawk perched thirty feet up in a silver maple tree near the back fence. The hawk, who I assumed was not auditioning for the role of Santa Claus, appeared in no hurry to take any action, so I decided to take some photos before bursting out the back door to scare it away. but our chicken Buffy continued to stand stock still under a bush. A female duck, with its sizable bill, is much more confident about defending itself than a hen. Buttons, our other chicken, was nowhere to be seen. Only after I stepped out back, and the hawk flew away, did I notice Buttons, hiding behind Buffy. The Pekin duck may have been sufficiently intimidating in size and manner to give the hawk pause, and my entry on the scene will hopefully discourage the hawk from returning for awhile. Egg production lately has been an egg each day from each of the ducks. The chickens are laying off egg laying, probably because we haven't given them supplementary lighting. The ducks and chickens require no heating in their coop, though the watering can freezes up if there's no heating plate underneath it. Other posts here on monarch butterflies have photos of the magical creature, but perhaps it's appropriate that this post does not. Having periodically searched this fall for updates on how many monarchs made it to their mountain sanctuary in Mexico for the winter, I finally found one. The news is not good. The monarchs didn't make their customary Nov. 1 arrival at their winter home, but instead began straggling in six days later, and now occupy only twelve trees. According to a NY Times article entitled "The year the monarch didn't appear", "Last year’s low of 60 million now seems great compared with the fewer than three million that have shown up so far this year." Researching the monarch, I had heard that climate change might render their high altitude winter home too warm by the end of the century. Another expert, Chip Taylor, suggested the miracle of their migration might come to an end as soon as thirty years from now. An oped by a NY Times editor, entitled "Monarchs fight for their lives", stated, "One recent study suggests that the long-term survival of the species may be in doubt." But so pervasive has been the displacement and destruction of their critical habitat in the central U.S. by corn fields and pesticide use that their survival from one year to the next can no longer be taken for granted. That they arrived late this year at their winter roost could have to do with weather patterns, or it could be evidence that dwindling numbers deprives the monarchs of the mass momentum that each individual must feel in a mass migration. What could help? A shift away from GMO corn and soybeans, a return to growing these crops for food rather than ethanol, and a return to giving the monarch's critical food source, milkweed, room to grow along roadsides, between fields and on land set aside for erosion control. But just when might that happen? Whatever we thought we had learned from the loss of the passenger pigeon early in the last century, the lesson obviously was not learned well enough. The corn and soy fields of Iowa, Nebraska, Illinois and other central states have long been considered largely barren of other life. The Chicago Wilderness initiative to restore the rich intersection of northern, western and eastern flora in the Chicago area demonstrated how urban development can host accidental or intentional sanctuaries for biodiversity that would have long since been lost to plow and spray in agricultural zones. What we learn in the story of the monarchs is that until recently those agricultural lands were still harboring populations of weeds sufficient to sustain butterflies. Only in the past fifteen years or so, as Roundup Ready corn and soybeans came to dominate, and the subsidized demand for ethanol motivated farmers to plant right up to the edge of roads and fences, did the extermination of weeds like milkweed approach complete. The impression created is of the genetic cleansing of some 150 million agricultural acres, with nothing left, after the gassing of the last remnant gypsy weed populations, but the master race of crops marching in rows. Other factors compound the monarch's vulnerability. Though most large-scale cutting of trees in their Mexican sanctuary has been stopped, locals still sneak in to cut trees here and there. The thinning out of the forest increases the monarchs' exposure to occasional snow and ice storms. Extreme and freak weather events, becoming more frequent as the climate changes, are all the more dangerous when a species' numbers have dwindled. "I gave a lecture to my 60th reunion class at Princeton University. At the end of my talk, I'd spilled my guts out over the whole monarch situation and my history of studying it for now 55 years. One man in the audience asked me, 'Well, what difference would it make if we lost the monarch butterfly anyway?' I took a deep breath and I looked straight into his eyes and said, 'What difference would it make if we lost the Mona Lisa?' The audience went very silent. My brother and his wife traveled this past summer to Iowa, to search graveyards for ancestors and see the landscape where her recently deceased mother grew up. Her mother's name was Lucille. She had spent her youth on a farm not far from the Mississippi, where the bluffs along the river transition into the great flat expanse of the plains. Back then, farms were small, within shouting distance of one another, and well populated by farm animals and people. What they found on this trip was an eerie silence, a void filled only by endless fields of corn and soybeans. No animals, no people. Land is largely owned by descendants who have long since moved away and lease their land to be farmed as part of large scale operations. There's a flurry of activity in May, when massive machines prepare and plant the fields. Then little activity can be seen beyond an occasional spraying until fall harvest. Anyone wishing to open a business in the small towns would have their pick of many a shuttered building. To appreciate a monarch's predicament in such a landscape, think of Cary Grant in the cropduster scene in Hitchcock's North by Northwest. This is America's empty heartland, the product of economic forces magnified by misguided government policies that drove people and nature from the land. And what sort of heart has a nation that would allow a miracle like the monarch's migration to teeter on the brink? A newsletter from the Pennsylvania chapter of the Nature Conservancy came in the mail. Did I send them money? Who knows. All sorts of newsletters keep coming, and sometimes they get read. A case study on their recently acquired 640 Brush Mountain Preserve caught my eye. Princeton has similarly substantial preserved lands. The title was "Managing Forest Resources for People and Nature". Note that they put people before nature in the title. One of the higher ups at the Nature Conservancy spoke at Princeton University not long ago, and said they had found that their message went over much better if they emphasize people rather than such aspects as biological diversity. In addition to emphasizing benefits to people by referring to forests and water as resources, they also call for active management: "The Conservancy is actively working ... to conserve forest and freshwater resources to benefit people and nature. Sustainable forest management is a key strategy to accomplish this goal." If sustainable forest management is a key strategy, what form might it take in Princeton's preserves? This reciprocal relationship, in which nature sustains people and people help sustain nature, is particularly important given today's realities, when multiple negative human impacts are making nature less self-sustaining. "Protected areas require active management to maintain their natural resiliency--their ability to adapt to changing conditions and rebound from stressors." The stressors, except for the overabundance of deer, remain unidentified. Terms that set some people off, like climate change or invasive species, become "changing conditions" and "competing vegetation". Biodiversity is expressed through the word "resiliency". would become in 2050 Chestnut Oak, Red Oak, Scarlet Oak, Black Oak, Pitch Pine, White Pine, Birch, Black Cherry, Red Maple, and American Chestnut. The Nature Conservancy has multiple partners helping to inform this sustainable management: among them Audubon, the American Chestnut Foundation, the Pinchot Institute, universities and the state game commission. Looks like a useful model for when Princeton takes on active management to complement the acquisition of open space lands. Here's a series called Around the Farm Table, with videos about sustainable farming that a former Princetonian, Joe Maurer, is filming in Wisconsin. They've had four shows on PBS thus far. I contribute clarinet improvs for Joe's original music. It's a show populated by upbeat people and very healthy plants and animals. 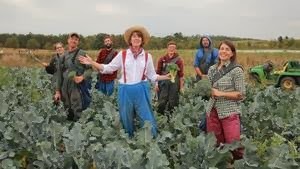 A segment called Picnic in the Pasture pays a visit to a farm that does "forest gardening", (four and a half minutes into the video) also known as permaculture, which breaks down the distinctions between forest, orchard and field. Food, fuel and medicines all grow in the same area. For fruits, there are red currants, elderberries, quince, saskatoon, honeyberries and kiwi. There's talk of guilds, defined as a "perennial polyculture of multipurpose plants" that grow well together. In my twenties, into organic gardening and companion planting, with little interest in native plants, I had this dream of an acre of fruit trees and vegetables so auspiciously planted that each plant would prosper in just the right niche. Squash would spread in the light shade of asparagus or small trees. Beans would climb on corn or sunflowers. Weeds wouldn't have a chance in all the lush growth. The soil would be rich with organic matter, the work minimal. I would bask in the shade with a refreshing beverage, periodically venturing in to harvest what I needed. This show has that feel, though it's clear there's a lot of hard work behind the joy and bounty. Street trees are spared the competition they'd face from other trees if growing in a woodland. Instead, they must contend with manmade constraints above and below. The urban landscape is a struggle between the dynamic nature of trees and the static nature of human infrastructure. What this street, Birch Avenue, needs is trees--though likely not birch trees--to provide cooling shade for the street, the parked cars and the houses in the summer. But any tree plant planted on the left side of the street has to deal with the overhead wires. This pin oak is on the other side of the street, with no wires above, but faces considerable constriction at ground level, with sidewalk on one side and curb on the other. It appears to be thriving nonetheless, but partly at the expense of the confining pavement. It has actually pushed up the pavement of the road, just enough to cause a potential hazard for snowplows whose blades could be damaged by any bumps in the road. And the unevenness of the sidewalk presents a potential tripping hazard, particularly for elderly pedestrians. The tree's roots also caused some damage to a residential waterline. Should this improbably thriving tree come out, or is there some way to accommodate the needs of people, machines and tree? One big step forward was the recent decision by town council to take responsibility for care of sidewalks. The unevenness of the sidewalk can be smoothed out by grinding down the raised section of concrete. This isn't an isolated issue. Here's another tree starting to push the curb out. Birch Ave. is providing a good test case for how to integrate trees into a very constricted landscape, so that all their benefits of shade, air conditioning, carbon sequestration and beauty can be enjoyed. We didn't have tracks like these in the backyard last winter. What could they be? No, not the robins, who paid a visit to the water tray the day before. Not the wild turkey that surprised us with a visit last year. minipond heaven, or at least haven, courtesy of the recent rains. The ducks show far more courage than their coopmates, who are playing chicken in the warmest corner they can find. The Princeton Shopping Center has something for everyone, even extinct megafauna. Those lumbering megaconsumers extraordinaire have been no shows for more than 10,000 years, but that doesn't keep the honey locust in front of Bon Appetit from laying down an appealing spread of seedpods every year. Munchables only a megafauna could love, perhaps, but a little internet browsing leads to the conclusion that the "honey" in honey locust comes not from its flowers but from the inner lining of its pods. In many legumes, including honey locust, this lining is edible, and may well have been eaten in some era before McCaffery's Market sprouted up across the street. Passing by an even more opulent spread beneath a big honey locust in front of the university's engineering building, I found a pod that hadn't dried out yet, opened it up, and tasted the thick, honey-like paste inside. Sweet, and with a taste unlike anything else I could think of. There was a slightly bitter aftertaste, but that may have had to do with the timing of my harvest. The honey locust, affectionately known by us botany types as Gleditsia triacanthos, is also ready in case some genetically reconstituted megafauna escapes from the laboratory (located in an unmarked warehouse on the outskirts of Princeton) and is not content with the tree's peace offering of pods. Osage orange, written about last week, exhibits similarly archaic adaptations to the same ghostly clientele. Birders Lee and Melinda Varian tell me there's a major influx of snowy owls into New Jersey from the far north. My first thought was not appropriately celebratory, but rather of the pilot whales stranded in shallow water in a remote section of the Everglades, and whether these mass displacements of wildlife might be signs of the big changes coming down the pike. After all, the NY Times earlier in the week had hidden a major warning about global warming on page A24, citing a "risk of rapid, drastic changes in some human and natural systems", and, relevant to the whales, "the threat of immense dead zones in the ocean." Since snowy owls feed on lemmings, maybe they came down this way on the rumor that humans are exhibiting a lemming-like affinity for metaphorical cliffs. Turns out, however, that this visit from snowy owls is not a new phenomenon. Melinda sent me links to a few posts on the subject. This post grapples with the question of why the snowy owls sometimes come down our way from the arctic. Some believe they come down because the lemming population up north has gone over a cliff (so to speak), but there's evidence that the incidence of snowy owls hereabouts is the product of a good breeding year for the owls (due to an abundance of lemmings), which means the young have to range farther for new habitat. The freidaybird blog counts 26 snowy owls in New Jersey, a number it says is not likely to be equaled for a long time. Typing "snowy" in the searchbox at the upper left of the blog gets more posts on the owls. They can sometimes run into trouble during visits to New Jersey and elsewhere (Melinda says one once showed up at the airport in Hawaii). They seek out flat, open, grassy areas that remind them of the arctic, which means they can sometimes gravitate to airports where they are considered a hazard. The beaches and dunes offer a much safer haven, where they can bask in the appreciative attention of birders. It was a walk through the ages, as thirty people came on the first Friends of Herrontown Woods nature walk last weekend, to see the Veblen House and farmstead, and the newly restored trails through the 142 acre tree-and-boulder garden. There were kids, adults, and a cockapoo named Wynston, whose name was claimed to be the only one that rhymes with Princeton. and the intimate embrace of trees and rock, as with this white oak. Some time ago, we counted the rings of another white oak that had finally succumbed to a windstorm in this mature section of forest above the cottage, and found it to be at least 150 years old. The trees and the boulders co-led this nature walk, speaking so eloquently of time and endurance. which Kurt had pointed out earlier. Peter Thompson later sent us a link explaining the stone splitting technique used back in the day. In some places, the land is pockmarked, as if boulders had been extracted from the landscape like molars, leaving a broad hole in the ground. How the broken off pieces were transported, and to what use they were put, is part of the unfolding story as Herrontown Woods undergoes a restoration that in some ways is like the restoring of a painting, at once timeless and dynamic. Time will tell if the past's story will be told. Perhaps some of the quarried stones ended up in this circular horse run--a bit of culture overrun by horticulture, in the form of wisteria likely planted long ago by Elizabeth Veblen. The walk benefited from all the collective wisdom assembled. Many came who work to sustain other parks and preserves--Marquand Park, Gulick Preserve, TRI, Mercer Meadows. A couple who had been active with a Friends of Herrontown Woods group in the 1970s came, ready to help with this new wave of energy and interest. It felt good to have Princeton's original nature preserve back in the fold, its arteries cleared and flowing with appreciative humanity once again. These daylillies decided that late November was a good time to start growing. In that sense, they are carrying on the tradition my daughter started last year, choosing November for her lobbying campaign to get us to buy mail order ducklings. The impulse for the daylillies to grow came from their position at the edge of a pile of fresh woodchips dumped there a month earlier. The heat of decomposition must have been enough to warm the soil. Hope they didn't blow all their root energy reserves on this false start. Looks like somebody didn't finish their Thanksgiving dinner. In fact, I don't think they even showed up at the table. This Osage-Orange, a native tree named after an Indian tribe, grows next to Princeton Pike. Indians reportedly prized their wood for bows, and colonists used them as living fences. As a species, they don't get around much anymore, mostly because the megafauna with the teeth and digestive system to eat their formidable fruit, and transport their seeds, went extinct in America more than 10,000 years ago. The megafaunas' extinction conspicuously follows the arrival of Homo sapiens to this continent. The giants that once roamed our piece of the earth--among them mastodons, woolly mammoths, giant sloths, horses--not only transported the seeds but served other ecological services, transporting nutrients from floodplains up to higher ground and maintaining clearings with their massive appetites. To the osage-orange, add the honey locust, Kentucky coffeetree, and pawpaw as rarely occurring species that might have once been more common if their seed dispersers hadn't disappeared. Next Thanksgiving, for something different, consider inviting some genetically reconstituted megafauna to dinner, and don't forget the Osage-Orange. (Cross-posted at VeblenHouse.org) Come join a nature walk this Saturday, Nov. 30, at 1 pm along the newly renovated trails at Herrontown Woods. Beginning this past July, volunteers Kurt Tazelaar and Sally Curtis took it upon themselves to clear the trails, which had become largely impassible over the years due to storm damage and invasive shrubs. All of the original trails are now open. and look out across the valley from a newly rediscovered bluff. Dress warmly, and enjoy the light-filled forest. Kids welcome, and dogs on leashes. One fairly rare sighting, both in Princeton's woodlands and parks and along streets, is a young tree. The great Mercer Oak that was finally blown down after 300 years of life was replaced in 2000 with an offspring, but how about all the other trees that have been lost in recent years, and will be lost if the predictions of Princeton's recently completed tree inventory prove correct? Perhaps we've gotten out of the habit of planting trees, having long been spoiled by their abundance. This blog takes all sides on trees, praising one tree, ruing another, finding tranquility in a deep forest or opportunity in the sun-filled opening a fallen tree leaves behind, and ever thankful for how they give both in life and death. This post offers examples of young trees growing in auspicious locations, and all the wonderful work they are already doing. First, I'd like to thank a neighbor for letting a volunteer red oak grow in a perfect spot to shade my driveway and pickup truck. They probably haven't even noticed it, but I do. Seems like just the other day it was a little sprig peeking over the fence. And thanks to the folks, too, who paid for a tree to be planted in Potts Park to celebrate the birth of their son. We chose the spot carefully, wanting it to eventually shade the play equipment through the summer, but not be out in the field where it might intersect with a kid running after a ball. Many swings and play structures around the world are not being allowed to live up to their full potential, abandoned by kids when they overheat in summer for lack of a tree. Another red maple, though perhaps better to have been planted on the house side of the sidewalk, is beginning to fill one of the many gaps along our streets. We need many more trees like this one to keep Princeton's pavement from baking in the summer. The more this tree shades and transpires, the less pedestrians will perspire. Hard to believe that not long ago this pin oak and American elm were little two foot volunteer seedlings my neighbors transplanted to their front yard. Their faith in the growth force in modest saplings, and the remarkable way time has of passing, is quickly yielding a visual buffer and afternoon shade for their house. This backyard tulip poplar was another volunteer transplanted to a spot well away from the house. This young backyard white oak is doing a good imitation of Mercer Oak Jr. over at Princeton Battlefield. Just beyond the fence, in Potts Park, a grove of white oaks planted by the town has matured into a favorite spot for picnics and birthday parties. and a fig tree bearing delicious figs in a protected spot next to the driveway. Though ginkgoes don't support wildlife the way native trees do (a recent article in the NY Times reports that only a few insects feed on ginkgo, while an oak serves up food for more than 500 insect species), these stilty varieties are shading the way along an improbably narrow space over at the Princeton Healthcare Center. I like to think that the proximity of young trees, with their dynamic growth happening at our level, puts us better in touch with an aspirational energy that can feed our own. When I hear Copland's Appalachian Spring, I think of young landscapes--prairies and early successional stages. In addition to the mature beauty of a forest, we need among us these renewing landscapes, these fresh beginnings, to feed our spirit. One of my favorite native prairie grasses is purple muhly. It's common name comes from its latin name, Muhlenbergia capillaris. The species name, capillaris, comes in turn from the latin word for hair, referring to its fine texture. Each fall, these two specimens in my neighborhood turn into purple clouds. Though I've never seen purple muhly growing wild hereabouts, there are other native prairie grasses to be found along the gasline right of way and the towpath: switchgrass, Indian grass, little bluestem, broom sedge, and big bluestem. The one place I've seen purple muhly growing in the wild is in Durham, North Carolina, in a little piedmont prairie remnant that I'm proud to say we just saved from development. A flurry of emails and some timely intervention by city council members spared the roadside prairie from being obliterated by a "sidewalk to nowhere". Convention requires that a sidewalk be built, whether pedestrians would have any occasion to use it or not, and the typical landscaping imposed is turfgrass. The result, in this case, would have been to destroy an ark that had carried more than 100 species of native wildflowers, grasses and shrubs safely from colonial or pre-colonial times to the present. The complex interaction of plants, soil and hydrology is distinct to that site, so moving the prairie was not an option. The prairie remnants in Durham have some kinship with our Princeton Ridge, in that both are characterized by underlying diabase rocks from which their soil is derived. The soil has a distinct chemistry that in turn supports a distinct flora. Princeton is at the northernmost extent of the piedmont, which extends down through North Carolina and beyond. Why Does Black Locust Grow Next to Historic Houses? One of my favorite trees, black locust, generally gets a bad rap. Though native to the Appalachian Mountains, it is considered invasive elsewhere and portrayed by many as a bad actor in the garden. And yet, large and noble specimens can be found growing next to more than one historic house in the Princeton area. Walk behind the Clark House at Princeton Battlefield and you'll find two big specimens towering over the house (on the right in the photo). Brearley House in Pennington similarly has five big specimens (a couple can be seen on the left). The Veblen House in Herrontown Woods has remnants of a mature grove of black locust close by. The black locust shows up not only in the yards of historic houses but also in the histories of great men. There's the story of how Lincoln spent much of his time as a young man splitting rails and fence posts from black locust logs. John Muir is said to have had his first, fateful botany lesson under a black locust tree on the campus of the University of Wisconsin in Madison. One potential downside of black locust is its capacity to sprout abundantly from roots after being cut down. This can be annoying in a garden, and in areas of the country with prairie remnants, it reportedly can become a woody bully, shading out these highly sun-dependent habitats and re-sprouting aggressively if cut down or burned. In groves where it was grown for making decay-resistant fenceposts, however, its resprouting from the existing root structure conveniently reduced the time between harvests. The criticism that black locusts take on the web--thorns, brittle branches that fall in windstorms, aggressive sprouting--conflicts with observations in my neighborhood, where there are several beautiful specimens in people's front yards that the owners are very pleased with. Black locust is a fast-growing tree that offers first rate fence posts, firewood that burns unusually hot and clean, abundant flowers for the honeybees, and an appealing contrast between dark, craggy limbs and dissected, light-green leaves. These are the features that may explain its presence in historical landscapes. Our two backyard ducks turned one today. What does one do for a duck on its birthday? A nice little pool full of fresh water is a good start. It wouldn't be right for a duck to be a duck out of water on its birthday. Hard to believe they were once a living version of rubber duckies, little more than a day old, freshly delivered from California in a cardboard box to the Princeton post office out on Route 1. If any month can be called normal for receiving ducks in the mail in New Jersey, it's definitely not November. Still, things worked out. They and their baby mallard companions lived their first days and weeks in a spare bathtub with furniture provided by our younger daughter. The accommodations came with all you can eat oatmeal and starter food from a farm supply store just up the road. From day one, they were ready to follow us anywhere, including an extensive hike in the local nature preserve. That is they, down by her feet. Daisy, upper left, is a Pekin duck with a mass to wing ratio that makes flight beyond a few feet problematic, but I like to think that her impressive size and personality is helping give hawks second thoughts about swooping in. The mini-ponds were a plus during the rainy spring and summer, though lack of heavy rains in recent months has left them dry. Molly, on the right, is a runner duck who expresses a lot of her duck thoughts and feelings by bending her neck in various directions as she walks. The tub gets filled with runoff from the roof, and can be tipped over and emptied if mosquito larvae show up, or if the ducks make the water muddy. The ducks are quiet most of the time, but can get into conversations. Neighbors tell us they like hearing them, and the sounds must come as a surprise to users of the public park behind our house. Beyond an occasional coop cleaning, there isn't much more to having them than opening the coop up in the morning, giving them food and water, and making sure to close the door of the coop at dusk after they've gone back in. It's nice to have pets that really enjoy the yard. When it comes to ducks and giving, we get far more than we give, with each of the ducks bearing an egg a day. Happy birthday, Daisy and Molly!